The Beach Club...Luxurious Gulf Shores Resort! the Best Place for Relaxing ! Keywords: Luxurious, one stop vacation spot, Condo, Amazing Vacation for anyone! The Beach Club is the ultimate vacation experience for the entire family. A true destination resort with all the amenities! This up-scale beachfront village consist five outdoor swimming pools and one indoor heated pool, numerous hot tubs, beachfront access, restaurants, eight lighted Rubico tennis courts, basketball and kid's playground. a full-service spa. The Village Market and Grill offers grocery, deli items, beer, wine and casual dining. This is a gated community with 24-hr security. My sister and I own this unit and we LOVE the Beach Club. We own a catering company and an event rental company in Mississippi so we are constantly working but slip off to the beach when we can! One hubby is a professional tennis player and one hubby is a physician so they have a fairly busy schedule as well....but they like the 'beauty and calmness' of this resort. We have 9 units that we rent but this unit is the cutest and if you prefer to be on vacation at The Beach Club, this is the unit you want. We have a private housekeeper for our units so hopefully the attention to detail is obvious. This unit is in a PERFECT LOCATION...We purchased this unit for the location overlooking the pool and facing the beach with a wonderful view! We have children so it was so easy to enjoy sitting on the porch and watching them when we didn't want to be at the pool. You can actually have a conversation with them yet be removed from them if you prefer. We liked the location so much we actually bought the same unit three years later in Avalon building. This unit is simply adorable! The condo has been updated with granite and tile....beautiful plantation shutters and great colors. 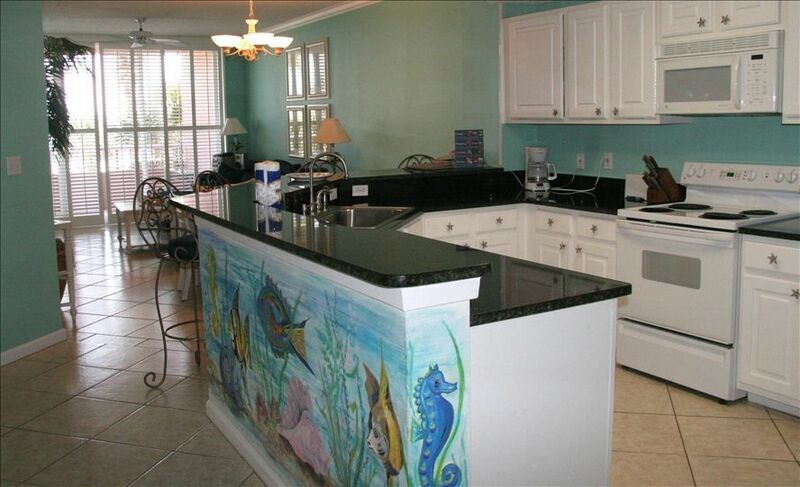 It has a professionally painted under-the-sea ocean scene under the bar...complete with sparkling mermaids. It is tastefully decorated and very, very charming. Most of our renters are repeat and the new renters are actually referrals from our past renters. I think that speaks volumes. What a fantastic, family-friendly condo! We had the best time playing in the pools, swimming in the gulf, hunting for crabs and walking on the boardwalk. The condo was clean and spacious. My two kids loved having their own room with their own beds. We loved having a space of our own with access to the balcony! The furniture easily fit our family of 4. The balcony has a gorgeous view of both the gulf and the pool. It had plenty of space to eat outside, throw our towels on a chair to dry, and keep our sandy beach gear out there. Both Renee and the housekeeper were quick to respond to any questions we had. We hope to be back very soon! This was our 2nd time staying at The Beach Club and 1st time staying in this condo (208 Doral). Mrs Renee was wonderful to rent from...quick to respond to any questions/concerns prior to our trip and during! The condo was perfect for our family! I loved that it’s on the 2nd floor! We couldn’t have asked for a better experience. We love The Beach Club because it is somewhat secluded and less crowded (we came in September). We will be back!! Thank you so much! Glad you had a great vacation. Four of us stayed for a long weekend celebrating my birthday. The condo was clean and we liked how everything in the kitchen was labeled. The refrigerator was leaking water while we were there, and Renee quickly had a new one installed. She was very nice & helpful. Clean and represented just as internet pictures showed. Perfect location! Great location! Very chicly decorated and well stocked. Owners very responsive to questions. We would definitely stay in this unit again. We loved everything about our stay at The Beach Club! The condo was perfect as was everything about our stay. We enjoyed the activities at the lawn and the beach and pools were so relaxing and clean! The owners were readily available if we needed anything. We will be back!